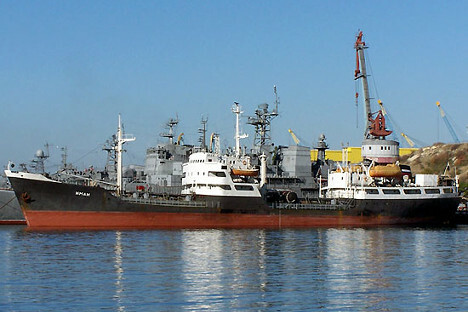 Tartus is being used as a logistics facility for Russian ships. Russia returns lost positions and ensures presence in the Middle East by expanding the Navy base in Syria’s Tartus, Andrey Krasov, first deputy chairman of the State Duma’s Defense Committee, told TASS. Russian President Vladimir Putin earlier ordered to sign an agreement with Syria on expanding the Russian naval base’s territory in the Syrian port city of Tartus. He tasked the Russian Defense Ministry to hold negotiations with the Syrian side together with the Russian Foreign Ministry and sign the document on behalf of Russia. "Russia needs this base to be present in this region," Krasov said reminding that Syria has always been the strategic partner of Russia and USSR. "Unlike NATO, the Russian Federation is the guarantor of security in the world," he continued. "In Syria, we fight against international terrorism not only by words, but also by deeds. Both Russian Aerospace Defense Forces and Russian Navy’s ship groups demonstrate their professionalism, high qualifications in supporting the Syrian Armed Forces in the fight against terrorism," he noted. "We are doing everything possible in order for long-suffering Syria to be cleansed from this plague - international terrorism," the lawmaker said. "When in the 1990s we did not hold any drills and closed our bases one by one - in Cam Ranh (Vietnam), in Cuba - no one cared about this, everybody was clapping their hands," Krasov said. "And now, when we rose from our knees, when we started to actively train our forces - and we are doing this on our own territory - our defense-industrial companies produce the most modern weapons, and no other army in the world has such equipment and such weapons - this worries someone," he noted. "We are worried, however, that NATO is approaching our borders. We do not get closer to anybody, but by these actions, we are returning the positions lost earlier, we are returning our presence in this region," he said.